Inside Linkspank: "In the absence of capital, creativity flourishes." "In the absence of capital, creativity flourishes." Next up on the contest front is not a contest, but rather a Spankathon. It's not oriented around spanking prowess, but rather being a believer in linkspank and putting your email invitations where your mouth is. * You make pledge for new users that you'll invite, and a prize to go with them. * Pledge prizes range from a Linkspank T shirt to a Nintendo Wii. * Then you invite your friends, making good on your pledge and earning your prize. I've bounced the idea off some people and gotten some preliminary pledges to build a little momentum before publishing to the site. So far the response has been positive. People like it in particular (a) if and because they already like Linkspank and wouldn't mind having more of their friends on there and (b) because they know that, if they can get their friends on, they can get their pledge prize - they don't have to beat someone else or get lucky. "Your generosity keeps our organization alive." In a way, the Spankathon is the opposite of another popular way to get the word out, which is having an "invite only" service. People have often suggested to me that Linkspank go the way of Gmail's early days and extend accounts based on invitation only. I was never sold on the idea for the spank. 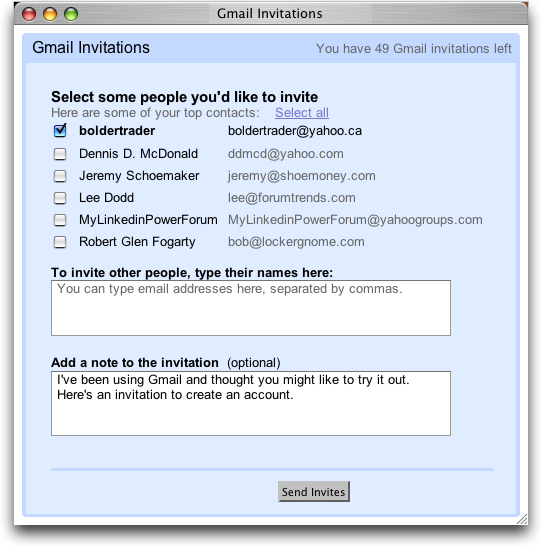 Invitation only made sense for Gmail because Google had tons of users who would have wanted to try Gmail, and with too many users their beta phase might well have been overwhelmed. Linkspank has no such problem because we don't have the #1 search engine! By the same token, I think Gmail should have come out of invitation only as soon as it was robust. The other reason for doing invitations only - to make a service seem exclusive - seems like crap to me. Maybe this tactic had its time, and that time is passed. But it seems too artificial, too transparent to me these days. Linkspank is recreational and it's not supposed to be exclusive. It's a place to hang out, not a Sky Bar, but a Cheers. As I said, early tests of the Spankathon concept have been promising. We'll see how it continues to develop! As for the title of this post: I think it's too easy to focus on "needing" to get money for a startup. The Tipping Point is a big reminder to the contrary: focus on small things and experiment to get it right. Money can actually distract from that process. Linkspank will need to get funding to grow into something big, but at the current stage it has been quite fun (and I think quite correct) to experiment with the contests and now the Spankathon.